The following is a transcript of a telephone interview between Damian Romano and E.J. Hradek which took place on 1/28/2010. E.J. Hradek is a senior writer for ESPN the magazine and also maintains a blog at ESPN.com. 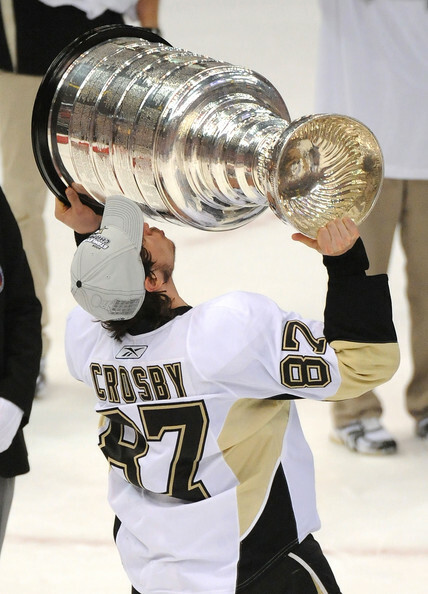 PU: What team(s) has (have) the best chance at dethroning the Penguins this year and why? EJ: I would say in the East it would certainly be Washington. The teams played a really tight 7 game series last year. In fact I believe Washington had the lead in the series up 2-0 and the Penguins came back, but it did go 7 games. Clearly Washington has a number of skilled players and I think that’s the Penguins biggest worry in the East. In the West Chicago has been great and San Jose has been playing great. So those two teams are certainly the best in the West. But I’d say Washington is their biggest threat since they’re in the same conference. If they meet in the finals together the Caps will be their biggest worry since they can really score goals. PU: Bottom Line: Can the Penguins repeat? If not, what is their biggest deficiency? EJ: They absolutely can repeat. I mean they have some world-class players that lead that parade there, so I don’t think it’s any question whether they can repeat if they can stay healthy and perhaps be helped along by some trade deadline addition to help Crosby and Malkin, particularly a winger. Maybe a guy like Ray Whitney from Carolina for example. What’s their biggest deficiency? I don’t know, they’re very strong in goal with a guy who has already won a Stanley Cup early in his career. Their defense has a nice mixture of puck moving guys and defensive minded guys. I just think right now they’re a little short on the wing with guys who can really play with Sid and Evgeni. That’s something they may be able to take a look at the deadline. I really like the Penguins though, they really have some high end centers they are really strong at the right positions for the team. I think they’re going to be a hard team to deal with even if they don’t make any changes before the deadline. PU: Imagine you’re the Penguins GM right now, what moves are you thinking before the deadline? EJ: Let me first say I think Ray Shero has done an excellent job. Yes he came into a situation with some highly skilled young players, but I think he has a real good grasp on the big picture and has made so many good moves that I just don’t think he gets enough credit. For me if I was out there I think I’d be looking for another guy who I could put on the top 2 lines on the wing. And Ray has been able to acquire guys like that in the last two seasons and I think he has a real good chance at adding a guy like that this year. PU: Earlier this season you in fact spoke with Penguins GM Ray Shero and asked which prospects would have a chance to crack the roster. With all the injuries to the Penguins early this season we had a chance to see a ton of them. Given your experience as a scout who is the best prospect you’ve seen thus far? EJ: Boy that’s a tough. I would simply have to say I just haven’t seen the guys enough. And there’s different levels of prospects within an organization. You got guys who you have that you expect to play that you want them to develop slowly, the kid they got from Anaheim last year, Tangradi, He’s a guy they really have higher expectations for. Then you have other guys in your system like Chris Conner who’s an older guy who came up and had a big game against the Rangers the other night. So I think they have a wide variety of different level prospects. But having not seen them enough its hard for me to give you an accurate feel for where they’re at. I don’t want to mislead you by trying to give you a good explanation of where they’re at because I haven’t seen the guys enough. In these cases is when I’ll call Ray and get his take on their progress. PU: With Sid, Geno, Gonchar the Penguins are somehow bottom dwellers on the power play. What is the biggest issue there and who do you blame for their failures? EJ: Well its funny because I talked with Dan Bylsma the other night about that very topic and he said they’ve been coming around. He just feels they’ve been a little too stationary, a little too easy to play against. He feels when they play stationary its not to their strengths being such high end players. I’d be interested in seeing the numbers over the last 6, 7, or 8 games and watch it over the next 6, 7, or 8 games and see if there’s improvement. Sometimes you start off badly and that number is low, but if you don’t go inside that number and break out the last few games you can be mislead. So its something they’re certainly working on constantly. The good news is we already know they’re a good 5 on 5 team and I think we’ve already seen you don’t have to be dynamic on the powerplay to win…. but…it’s a big help. But I’ll be interested in seeing if they improve before the Olympic break. PU: I have a tendency to think they might have too much talent and defer to one another a lot. Do you agree? EJ: I think they tend to try to be too cute sometimes with passes. That’s what happens sometimes when you have such highly skilled players they have a tendency to want to make the really nice plays and while that’s great when it happens, sometimes its just better to play simple. 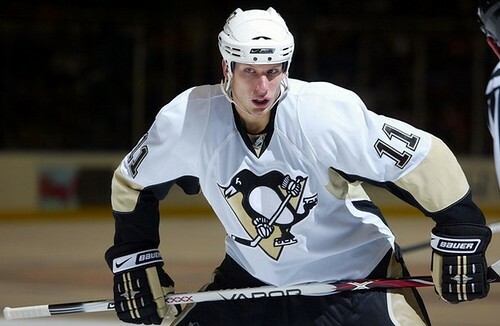 PU: Is the Penguins 3rd line (Staal, Kennedy, Cooke) the best in the NHL? EJ: Its really hard to say when you don’t see all the teams 3rd lines play a lot. I see a lot of teams play I just don’t see all their games. And when you’re talking about the 3rd line you’re talking more about the subtleties they bring to the game. I’ll say this, the Penguins get an awful lot out of those guys. They’re very lucky to have a guy of the stature of Jordan Staal on your 3rd line. On most teams he’s either your 1st or 2nd line center. I just think the world of Jordan. He’s the type of guy you want to have on your team if you want to win. He adapts well to different rolls and he can really raise his level of play in situations as needed. Matt Cooke has a really well defined roll as kind of a pest/agitator, kind of an energy player. Tyler Kennedy has been a guy who has been able to come up with big plays in big games over the last year or two and I think he’s continuing to get better. So I think it’s a really good line, but the key is Jordan Staal is a really good player. He’s kind of a selfless player who certainly has the ability to do more but given the nature of the roster the Penguins have. 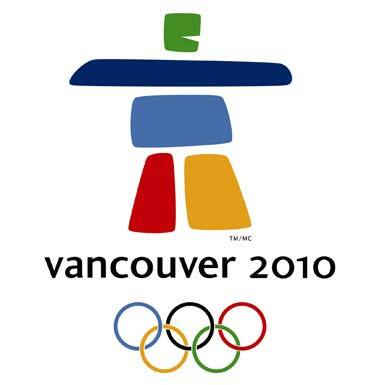 I’ll say this, when I was picking my Olympic roster I’d have in on Team Canada roster. PU: Speaking of Matt Cooke, you once called him a dirty player following his 2 game suspension against the Rangers earlier this season. I won’t necessarily argue that, it’s sort of a prerequisite for the job of an agitator. With that said who’s your pick for the dirtiest player in the NHL? EJ: I got to be honest I’ve always said there’s no angels out there on the nice. It’s a tough game out there. I don’t think there are many accidents. I think the guys who do what they do know it and know who they’re doing it to. I don’t know if there is a single dirtiest guy. I’m not going to back of my feeling about Matt, I think at times he goes over the edge in games which I think were really questionable decisions on his part. But again he has a very well defined roll and he’s getting paid to play a certain way. And it’s a tough job for a guy like him to play that roll and even all the guys around the league who play that roll. He’s been very successful in Pittsburgh so far and I think they’re very happy with him. PU: Thinking ahead, how realistic do you think it will be to keep their core (Crosby, Malkin, Staal, and Fleury) together for the duration? EJ: Well they are together for the foreseeable future. I don’t have the numbers in front of me but I know Ray has locked these guys up for at least the next several years. But things then again things change, circumstances might dictate things as time goes on. The team is moving into a new arena next year and that may be a way for them to stay motivated. But I think it all goes back to Ray Shero and the staff doing a good job at making decisions about singing their key players and filling in around them. So it looks like they’re going to be around for a little while. PU: If Sidney Crosby didn’t play another hockey game, is he a Hall of Famer? EJ: Well, I mean its awfully hard to vote a guy in the Hall of Fame for only playing 4 years. So I would say if he didn’t play another hockey game I would have a hard time voting for him. But certainly Sidney Crosby, I watched him against the Rangers and I’m just more impressed every time I see him. I would say he more of a complete player for the simple fact that he works just as hard on defense as he does with the puck in the offensive zone. He’s getting better all the time, he’s still a really young guy. You know he wasn’t good at the face off and he practiced and worked on it and he got good at it now. They say he wasn’t scoring enough goals and now he’s on pace for a 50 goal season. If I was starting a team he’d be the first guy I’d take because I value centers so much more than wingers. If I was paying to see a game I’d probably pay to see Ovechkin but if I was starting a team from scratch I’d take Sidney Crosby first. Your picks for the Olympics (Gold, Silver, Bronze). EJ: Canada, Russia, and I’ll go with USA. I think Canada and Russia will be in that last game and I think the USA because the games are here in North America and will pose an advantage for them along with their goaltending.